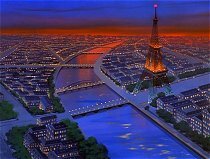 Move the cursor over the images that say "Changes: re-animated", to see the re-animated version. On Danielle's yacht, during the scenes where the yacht is trying to avoid the bigger yacht. After the table of food has fell over. 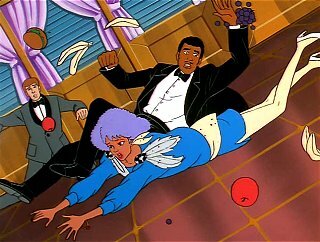 Changes: Removed and re-added scene: Anthony and Shana are falling down on the floor. 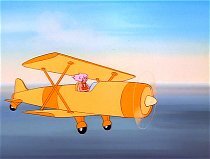 It was removed for the movie version, and then added again for the retakes version. 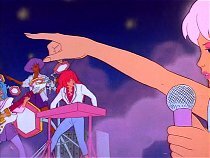 After the trouble on the yacht is over and Jem and the Holograms are discussing with Danielle, Howard and Anthony about shooting their next music video in Paris, and Jem says "first we finish cutting our album, then Paris". 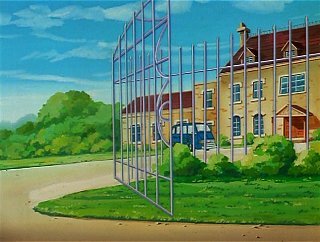 Changes: Cut clip: Before switching to the Starlight Girls at Starlight Mansion, we originally saw the mansion from the outside. Weird to remove this, since it makes sense to show the outside when switching to another location. 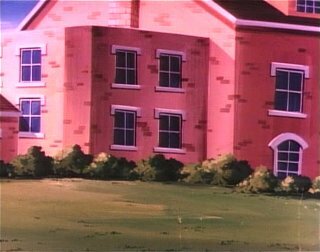 At Starlight Mansion, in the scene where Lela and the other Starlight Girls refuse to accept the money Ashley offered them for her debt to the honor jar, after Ashley says "You all hate me". Changes: Cut clip: Originally when Becky replied "it's not true", we saw her face. In the remade version we only hear Becky's voice. 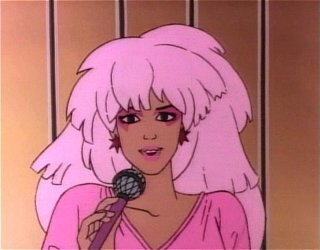 At the recording studio, during the rehearsing of the song "Twiligt In Paris", after the very first clip showing Jem and the Holograms and Rio in the studio. 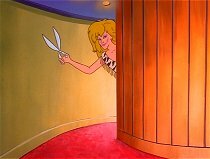 Changes: Cut clip: The next clip was originally of Jem. But now it switches directly to Shana. 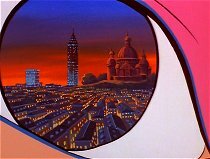 Same scene as the above, right after Aja is shown. 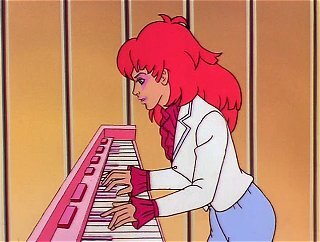 Changes: Added clip: Kimber playing the keyboard. At Starlight Music, after the building is zoomed in. Changes: Cut clip: The first clip of this scene was cut out, where we originally saw Eric with his back toward us, before turning around his chair and offering Zipper the money. 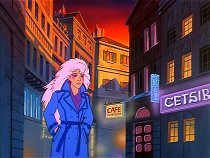 In Paris, in the scene where Kimber complains to Aja that Anthony gives Jem all the attention, right after Aja says "Kimber, don't get all bent out of shape". 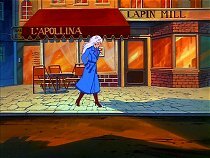 Changes: Added scene: Kimber walks off the set, and unknowingly into the direction where Zipper is waiting around the corner. Zipper: Keep coming sweetheart, right into my hands. Rio: Kimber, what's with you? Kimber: Don't play big brother with me Rio. 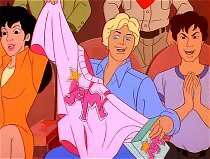 Rio: Jem is not trying to hoof the action, and you're acting like a spoiled brat. Aja and Shana walk back with Kimber. 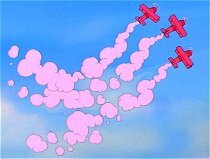 Aja: You were going to give away Jerrica's secret. Kimber: I'm sorry. But Rio has the right to know. Shana: Maybe he does, but that's up to Jerrica. 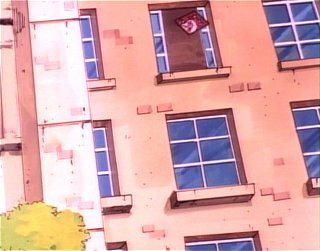 Zipper looks up to the roof of an building, and plans his next move. Zipper goes toward the entrance of the building. When Zipper is trying to get the gargoyle loose from the roof. 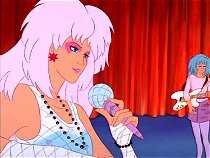 Changes: Cut clip: Originally he had to struggle some more to get it loose, and we got to see a clip of Jem and the Holograms from above. 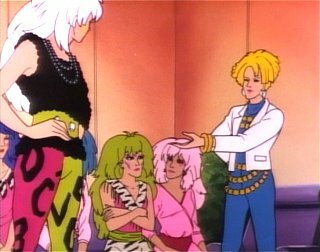 At the club the Misfits hang out at, right after Pizzazz has said to Ashley "from now on you're a Misfit". 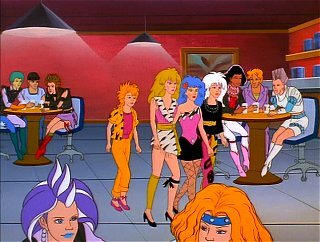 Changes: Added scene: The Misfits are walking inside the club and we see people like The Leatherettes and The Space Cadets, sitting at some tables. 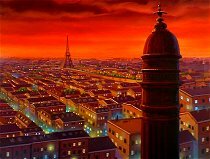 Pizzazz: A Misfit never asks for anything. The Misfits and Ashley take a glass each from the waitress. 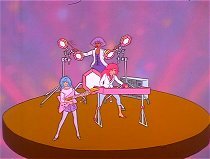 Pizzazz: Yeah, whatever we want. And none of this please and thank you stuff. 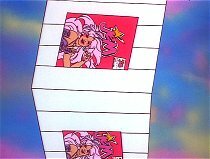 Pizzazz kicks the chair so a man falls, and scares him away with her fist. The Misfits and Ashley sit down by the table. 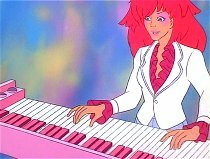 Pizzazz: Have you got that kid? Ashley: Yeah, I got it. 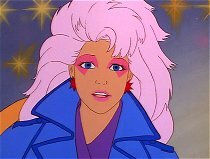 At the airport in Los Angeles, when Kimber says to Danielle "you mean Jem AND the HOLOGRAMS". 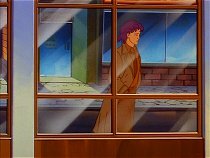 Changes: Re-animated background: The difference is that there is no window frame, just window behind them. 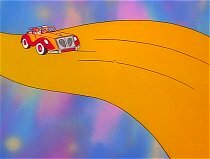 In town with the roadster, after Aja says to Jerrica "Don't take it so hard, a spin around town will cheer you up". 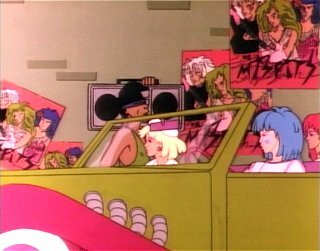 Changes: Cut clip: The first clip where a Misfits poster is shown on a wall and then the view moves to the right, showing more Misfits posters outside of a music store and the roadster drives by. This clip continued a bit longer before it was cut off, so we got to see a little more of the street. 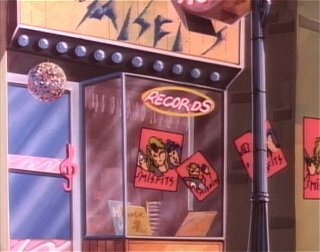 Changes: Re-animated background: Everything looks pretty much the same, except for the Misfits posters in the window and on the walls. 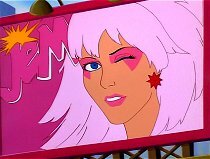 In the original version you could barely tell it was the Misfits in the posters. 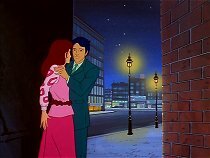 Changes: Re-animated background: This time the background is completely changed, to show the outside of the music store, as shown in the previous scene, but it's not the same background as in the last scene. This change makes sense because originally there was a wall in the background with posters instead of the music store that they stopped by just a second earlier. After Jerrica says "It's time we got down to business", Christy wanted to add an extra scene, which was not included. 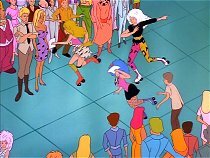 Changes: The song "Gettin' Down To Busniess" was extended alot. 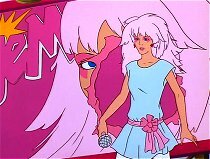 A scene in this music video was re-animated, where Stormer throws the Jem album out of the window from the radiostation, it was changed to show the antenna on top of the building. At the Starlight Mansion, right after the scene where Eric offered Kimber a record deal of her own. 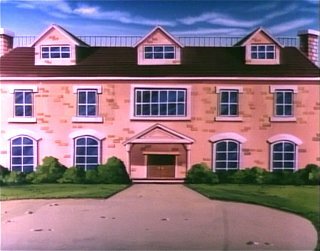 Changes: Cut clip: Originally there was first an outside shot of the mansion. 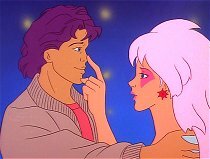 Changes: The instrumental of the song "Puttin' It All Togeheter" is playing in the background when Lindsey calls for Jem. 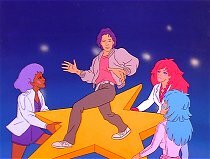 This song didn't appear until several episodes later, in the episode "Starbright Part Three: "Rising Star". 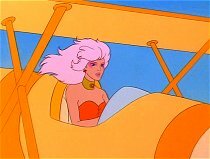 After Kimber drives away in the roadster on her own and Jerrica says "Oh Kimber". 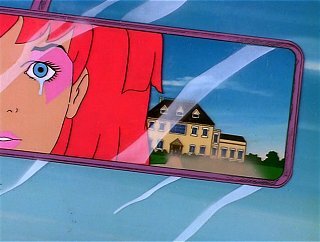 Changes: Moved clip: The clip showing Kimber in the rearview mirror with the mansion in the background, was originally set up in another order. Jerrica originally came inbetween and said "Oh Kimber" and then we saw Kimber looking in the rearview window again and this time the tear comes down from her eye. 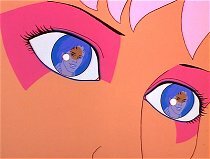 In the changed version, Kimber's tear comes already in the first clip. 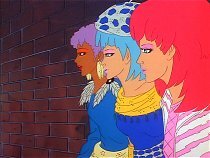 After Jerrica, Aja and Shana get into the Starlight Express and Shana says "She can be anywhere". Changes: Added clip: We get to see the Starlight Express start from Starlight Mansion. At KMAX radiostation, after Jerrica, Aja and Shana has gotten into the elevator. 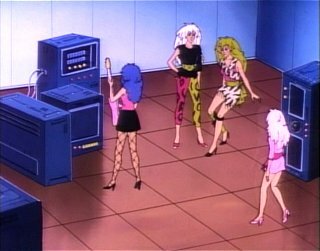 Changes: Added clip: A close-up of Jerrica pressing a button in the elevator, which zooms out into the scene that was originally there where we see Aja and Shana standing next to her. 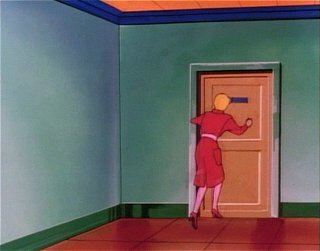 Right after the above, when the elevator doors have closed. 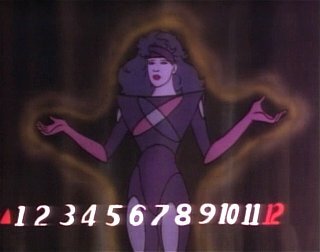 Changes: Cut clip: Originally Synergy appeared, resembling the fact that she was transforming Jerrica inside the elevator, and some numbers appeared on screen to show that they were going up 12 floors. 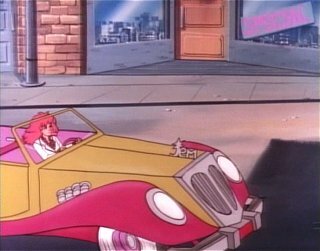 Right after Jerrica has transformed into Jem, and the elevator doors have opened, we see Kimber driving in the street, first driving around a corner, and then a close-up of the roadster. 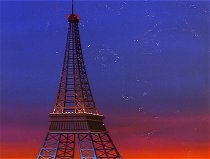 Changes: Re-animated background: The background was changed for some reason. Perhaps because there were supposed to be trees on the sidewalk, and also the roadster seemed to drive too slow in the original version. 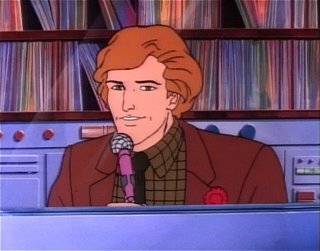 At KMAX, the first thing we see of the radio DJ Brian Morris. 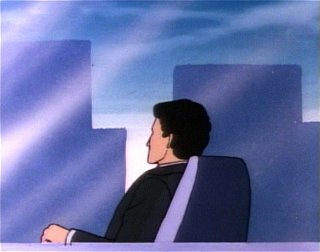 Changes: Re-animated background: Originally we saw the DJ sitting behind something like a desk, and in the re-made version we see a wall to the left. 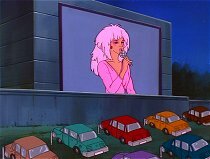 In the roadster driving around on the street, right after Jem has said on the radio "and without the Holograms, there's no Jem" and Kimber is seen in tears. Changes: Added clip: Kimber makes a uturn with the roadster. I didn't like this change, because it revealed in advance the special moment when Kimber returned. At the outside of VTV, after Rio has stepped out of his car. 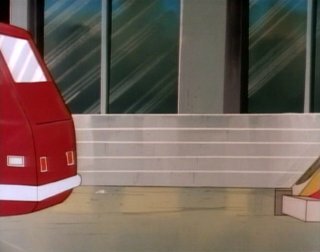 Changes: Added clip and removed clip: Rio opens the door for Jerrica and she steps out, instead of the original clip where we saw the Rockin' Roadster park behind Rio's car. 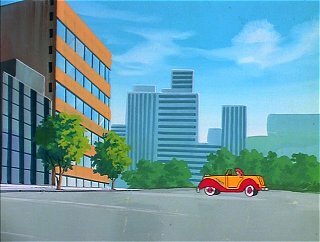 We still see the clip of the roadster being parked behind Rio's car soon after. At the inside of VTV. 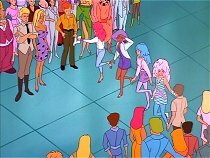 After the Holograms have rushed Jerrica away from Rio and into the building. 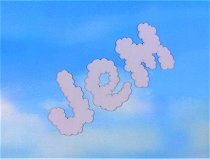 Changes: Removed clip: Jerrica is running toward a door which she will enter to change to Jem. 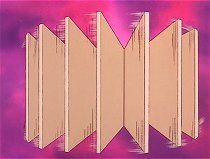 In the remade version we only see it from the inside, when she enters it. On the inside of the same room. 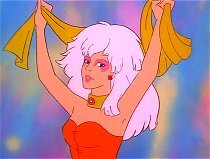 When Jerrica reachs for her earrings and is about to transform into Jem. 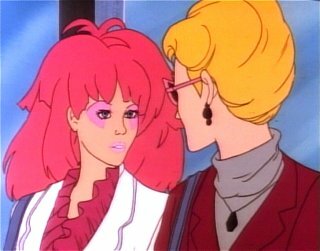 Changes: Re-animated scene: When the view moves to the left we first see Jerrica who changes to Jem, instead of seeing Jem directly like in the original version. And in the retake it's more of a close-up and we can't tell it's the reflection in a mirror until the view is zoomed out. 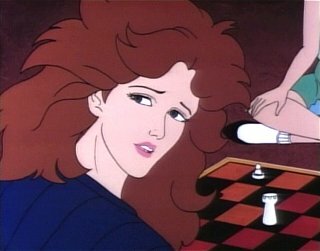 This was probably remade to show the actual transformation of Jerrica to Jem, and because Jem in the original version froze in this pose. At the Misfits' hangout place. 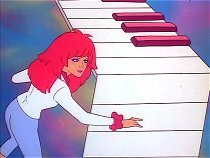 After Lindsey says "live from studio B, Jem and the Holograms". 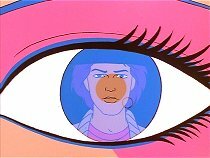 Before the song "I've Got My Eye On You" starts. 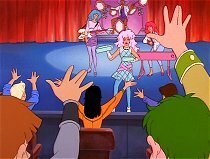 Changes: Added scene: The Misfits are sitting in armchairs watching the Lindsey TV show, and Pizzazz sees Jem and the Holograms and points towards the TV. 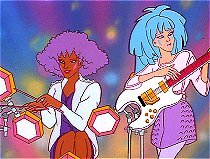 Pizzazz: Hey, they're on TV. 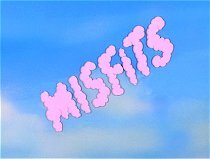 The Misfits exit the room. This scene was probably not written by Christy. At studio B, after the song "I Got My Eye On You", and after Lindsey says "that was absolutely terrific", before Kimber sits down. 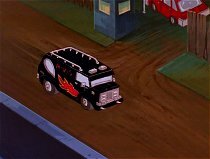 Changes: Added scene: The Misfits arrive in their van with Ashley outside the entrance of the building of VTV. 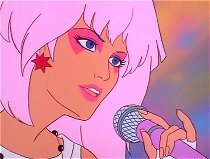 Pizzazz: I'm not letting Jem get all this publicity. 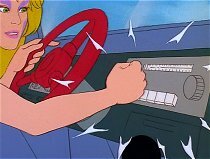 Roxy opens the door and the Misfits go out of the car. 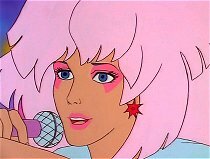 Pizzazz: Stay in the van. 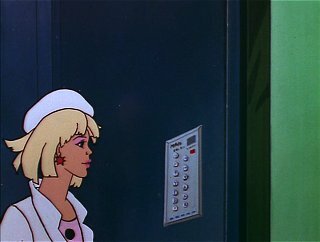 Pizzazz closes the door, and the Misfits get inside the building, but are stopped by a guard outside the studio. 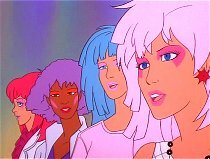 Pizzazz: But we gotta get in there. Guard: I told you, nobody gets in during a live interview. The Misfits turn around, exit the building and return to the car. 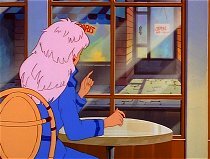 Pizzazz: Ashley, what are you sitting there for? I was only joking. Infact, you could do us a real big favor. 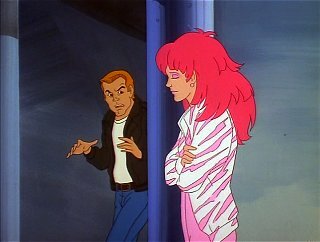 The Misfits and Ashley run into the building, and Ashley approaches the guard. Ashley kicks the guard on the foot, and runs away with the guard after her. Guard: Aw, you miserable brat. In the meanwhile the Misfits who were hiding around the corner, sneak in. After Lindsey's show goes to commercial and Roxy says "Hey, we wanna talk". 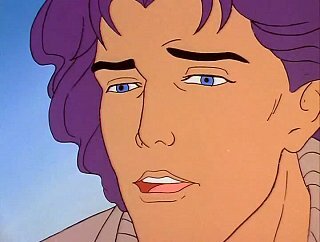 Changes: Re-animated character: Only the character Lindsey has been re-animated. Probably because her belt was moving up and down from cel to cel in a weird way. 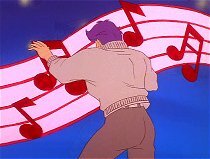 After Stormer says "yeah we wanna do a song" and runs out of frame. 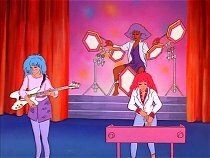 Changes: Cut clip: Originally we see Stormer approaching Aja's guitar and grabbing it, with Roxy and Pizzazz next to her. 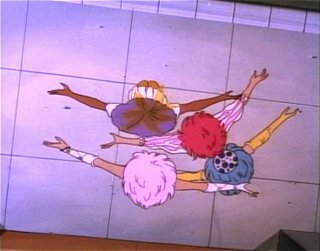 This must have been removed because it looked like Pizzazz was sitting in the air, without a chair. 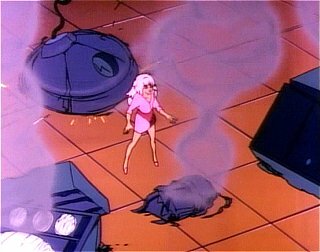 After Pizzazz has pushed Rio, and things in the studio start falling, and the big thing in the roof with lights is dangling above Jem. 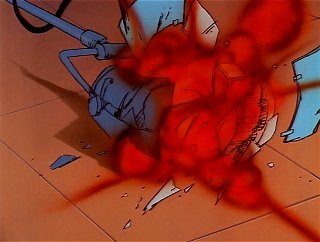 Changes: Moved clip: The floor lamp falls to the floor before we see the close-up of Jem. Originally it was the other way around. 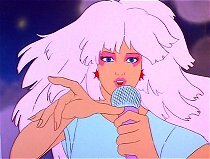 Changes: Moved clip: Close-up of Rio screaming "Jem", originally appeared just before the very last clip of the episode where Jem is standing among sparks. Right after Kimber screams "look out". 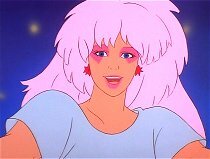 Changes: Cut clip: A zoomed out version of Jem, where we see a big round thing falling behind her, and a another light falling from the roof just to her left.